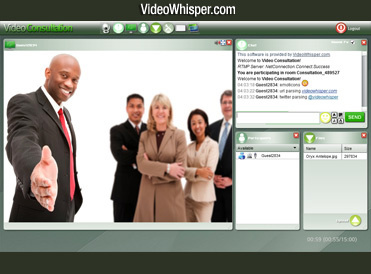 VideoWhisper Drupal Video Consultation is a premium high definition video communication edition for setting up online video consultations, interactive live presentations, trainings, webinars, coaching and online collaboration on Drupal. The module manages configuring the video conferencing software, creating video consultation rooms with mutliple settings, listing rooms, accessing room links and removing rooms. Drupal 7 integration includes Drupal Pay Per View Streaming support. After registering and login in, use Create Content / Add Content > Video Consultation room or Video Consultations: Create New Instant Video Consultation Room from the user menu to create a video consultation room for testing. How does Drupal Video Consultation integration work? Site members (as allowed by role permissions) can instantly create video consultation rooms and send the access links to other participants. Rooms are created as Drupal nodes. Links are provided and can be shared by any method (email, instant message). - Get VideoWhisper Drupal modules or links from download page. There is an All Drupal 7 Modules download that includes all VideoWhisper integration modules, vwrooms and vwcredits. - This module requires VideoWhisper Rooms (vwrooms), VideoWhisper Credits (vwcredits) and Date_api , Date_popup (from Date package). - Install (Install new module) and enable these requirements first (one by one or with all modules pack - recommended). - Install and enable Video Consultation (vcnf) module. Should be in VideoWhisper category. Click Configure for Video Consultation on Modules screen, and fill your rtmp application path (get it from step 1). Change other settings as desired. Click Permissions for Video Consultation on Modules screen and enable permissions as desired. Important: The standard Drupal module contains just the integration. You will also need to have the videowhisper application (which does not come with the regular tag.gz) copied to the website by FTP. If you already installed the drupal module, just copy the vconsult folder and contents to the root of your drupal installation. Login to your Drupal administrator account and go to Administer > Site Building > Modules in Drupal 6 or Modules from dashboard in Drupal 7 and enable Video Consultation. Should be in VideoWhisper category. Go to Administer > Site Configuration > Video Consultation in Drupal6 or Video Consultation : Configure in Drupal7 on Modules screen, and fill your rtmp application path (get it from step 1) and other settings. Go to Administer > User Management > Permissions , scroll down to vconsult module in Drupal6 or Video Consultation: Permissions in Drupal7 on Modules screen and enable permissions as desired. After installation a new menu will be available for users: Video Consultations. This will allow managing rooms created by that user and creating new rooms. Rooms can also be created with Create Content > Video Consultation room . Rooms are generated as Drupal nodes.